Even though "American Idol" producers seem to be really, really pushing for a female winner this year, they technically still have to give the guys a shot, and the second round of 10 dudes competed for the five remaining male slots on Thursday's "Idol." Early standout Burnell Taylor — now 40 pounds lighter than when viewers were first introduced to him — continued to shine during the episode, giving the night's standout performance with his stirring rendition of John Legend's "This Time." The Louisiana native's performance was hailed as "authentic and raw" by Mariah Carey, and Nicki Minaj politely informed him, "nobody else is in your lane tonight, at all, period." There was no question Taylor would graduate through to the next round, and when he did, he was joined by Cortez Shaw, Vincent Powell, Nick Boddington and Lazaro Arbos. Not as lucky were David Oliver Willis, Bryant Tadeo, Josh Holiday, Mathenee Treco and Gurpreet Singh Sarin, all of whom were on the receiving end of the sudden-death round's harsh cuts. For most, the eliminations didn't come as a surprise. Minaj was in a particularly feisty mood during the two-hour episode, coming down hard on Treco ("it felt very cheesy and karaoke"), Willis (she compared him to a child getting his first guitar on Christmas morning and trying to impress his parents) and Tadeo (she liked the falsetto note he hit at the end of "New York State of Mind," then kindly told him she didn't like anything else about his performance). But Minaj saved her toughest criticism for Sarin, the self-proclaimed "Turbanator." "Honeychild, hell no," she told him after his sing-songy version of James Morrison's "Nothing Ever Hurt Like You," effectively turbanating his "Idol" dreams on the spot. Shaw and Powell got much better marks from the judges. Shaw left Minaj breathless with his slow-burn, quiet-storm version of David Guetta's "Titanium," and Randy Jackson was impressed by his dynamic vocal range. Meanwhile, Powell's rousing version of Lenny Williams' "'Cause I Love You" brought three of the four judges to their feet — Minaj stayed seated — and had Jackson comparing his vibe to that of Frank Ocean and Miguel. "Finally," went Mariah's one-word rave after his performance. 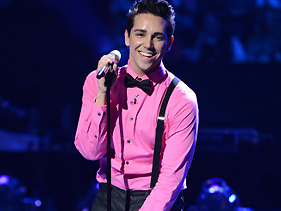 Arbos, the ice-cream scooper and bow-tie wearer whose extreme stutter doesn't hinder his ability to sing like an angel, gave the night's most emotional performance when he did Keith Urban's "Tonight I Wanna Cry." Arbos, whom it's nearly impossible not to feel for -- he has the most vulnerable face in the competition, and you just want to give the guy a hug -- was celebrated for the feeling in his voice and the honesty of his performance, even though the judges agreed it wasn't his strongest vocal performance. "There's a purity and a simplicity that comes from the emotion of your struggle, and what you go through and how music brings you through that," Carey told him. "American Idol" goes live next week, with the girls performing Tuesday and the guys performing Wednesday, and with the first cuts getting made during Thursday's 90-minute results episode.